My husband and I are both hot sauce enthusiast so when I was given the opportunity to sample, I couldn’t resist. I made us some yummy chickpea and cabbage tacos served with Sour Supreme and homemade guacamole and of course hot sauce on the side. We prepared ourselves with our Zevia Colas and then it was time to test them out. 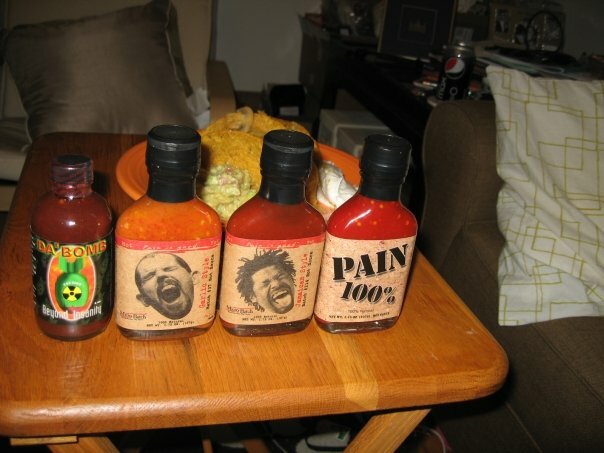 First we tried the Pain 100% (categorized as “Melt Down” on Original Juan’s website) both of our mouths were on fire, 2nd was the Jamaican Jerk Hot Sauce (“Zesty” category) which was actually really good and I would cook with it next time. Our third try was the Garlic Style Hot Sauce (“Firey” category) this was really spicy, but not too bad, however a little too vinergary for me. Lastly we tried Da’Bomb Beyond Insanity Hot Sauce which is categorized as “Melt Down” hot on the website. After all of these tastings my entire mouth was on fire I practically could breathe fire. My husband was also in pain but he tried much smaller samples of all of the hot sauces. We only tired hot sauces up to the “Melt Down” category, I can’t even imagine what the ones in the “Off the Chart” catagory taste like. You can also check out Original Juan on Facebook.